According to legend, blues legend Robert Johnson sold his soul to the devil at the crossroads to achieve success. Then at the ripe old age of 27, the devil cashed in the debt. Over the years there have been any number of rock musicians who have joined this “elite” club (Brian Jones, Janis Joplin, Jimi Hendrix, Jim Morrison, Ron “Pigpen” McKernan, Kurt Cobain, Freaky Tah, and Amy Winehouse to name a few). Check Wikipedia for a complete list. 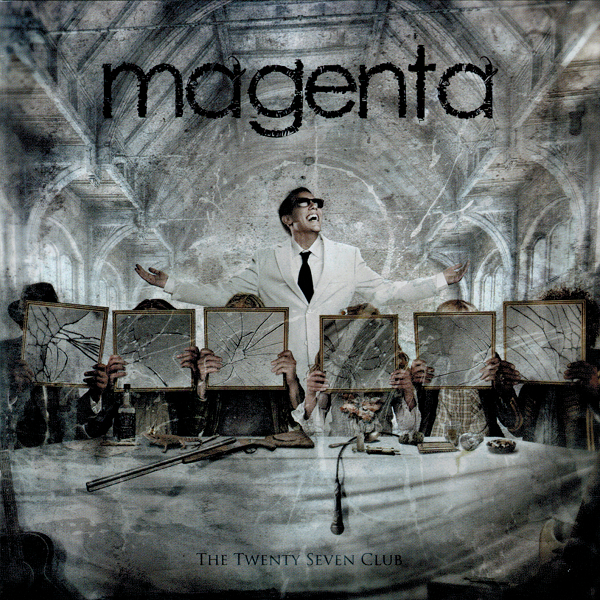 In 2008, Rob Reed of the Welsh prog band Magenta began working on a concept album about the Twenty Seven Club to try to craft the best collection of songs he could. Rob and his brother Steve composed songs for six selected club members “The Lizard King” (Jim Morrison), “Ladyland Blues” (Jimi Hendrix), “Pearl” (Janis Joplin), “Stoned” (Brian Jones), “The Gift” (Curt Cobain), and “The Devil at the Crossroads” (Robert Johnson). The basic premise is that each artist was tormented by internal demons that led to their untimely demise and the lyrics address different aspects or periods of their individual lives. On the surface you might expect from the song titles to hear musical touchstones to each artist, but that is not the case. Instead Magenta presents some intense and tightly orchestrated slabs of progressive music ranging from 7 to 15 minutes in duration. In addition to bandleader and multi-instrumentalist Rob Reed, Magenta is Christina Booth (vocals) and Chris Fry (lead guitar). Rob also enlisted drummer Andy Edwards (IQ and Frost) to complete the ensemble for this release. The guitars soar, the keyboards are excellent, and the drums are powerful. Plus Christina’s powerful and clear voice easily shines above the music. The music itself goes through many tempo changes and mood shifts integrating various elements of Genesis, Yes, and David Gilmour, as well as the heavier moments of Porcupine Tree. Without the song titles, you might be hard pressed to identify the individual artists, though Christina delivers a bluesy set for “Pearl.” Overall, quite an excellent effort from Magenta. Also included in the package is a DVD with a complete 5.1 surround mix of the album, a “Making of” video, and a promo video for “The Lizard King.” The Making of video is a mix of interviews and recording sessions documenting how everything came together. At 107 minutes, it does get a bit tedious watching Rob and Chris run through multiple takes trying to get the licks just right. However, it is enjoyable to watch the creative process in work and how well each member works together and accepts criticism. Closing the disc is “The Lizard King” video that is an excerpt of the song filmed on a sound stage.